As organizations face increasing internal and external challenges, the effectiveness of teams to deliver on performance goals will become a key source of differentiation between organizations who are successful and ones who fall behind their competition. Critical to a team’s level of effectiveness is the ability for individual team members to communicate with each other and the organization as a whole. One aspect of communication that is important to team performance is feedback. Learning and Organizational Change professionals are often tasked with implementing and driving the feedback process within an organization. It is important to understand the benefits and challenges specific to 360-feedback in a team setting, along with identifying success criteria for introducing this type of feedback within a team. This article will explore these considerations and demonstrate how introducing a formal 360-feedback process can increase individual self-awareness and transparent communication within a team and lead to an increase in overall team performance. The concept of 360-degree feedback originated in the 1950s and 1960s when the topic of organizational development was increasing in popularity and organizations saw a need to improve overall process and communication (Walderman, 1998). Initial efforts at collecting feedback were reliant heavily on upward feedback (Walderman, 1998). 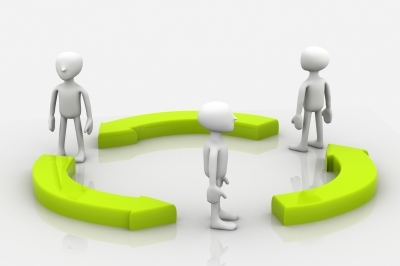 360-degree feedback has since evolved and expanded to include multiple rater groups. The image below provides a visual of Foster & Law’s (2006) “full-circle” 360-degree feedback model. One of the benefits of 360-degree feedback is that it includes input from various stakeholder groups, including supervisors, peers, subordinates, and the individual's self-evaluation (Foster & Law, 2006). Feedback from multiple sources is found to typically yield higher quality feedback that is more valid and reliable than feedback from a single source (Hurley, 1998). While Foster & Law (2006) believe strongly in limiting feedback to these specific groups, others such as Morgeson et. al. (2005) see value in including external customers, vendors or suppliers. The important condition is that raters are chosen based on their working relationship to the individual and how closely they know the person so that actionable feedback can be provided. Teams who utilize 360-degree feedback can increase the level and quality of communication within the team, leading to increased team performance. Research has found that both formal and informal communication often increases after the implementation of 360-degree feedback, and an increase in two-way communication can be seen between team members (London & Beatty, 1993). As feedback results are delivered and discussed among team members, communication is shown to become more frequent and more transparent (Antonioni, 1996). Participants report that issues that previously may have been difficult to discuss become easier to address because of open communication channels and removal of the fear of retaliation (Peiperl, 2001). As teams continue to seek out feedback from each other, they increase trust with each other and are more likely to achieve performance goals (Mamatoglu, 2008). Using 360-degree feedback within a team environment can lead to an increase in self-awareness among team members as individuals consider assessments of their own performance compared with others' assessment of their performance. Self-awareness can also contribute to increased communication and transparency among team members, enabling the team as a whole to perform at a higher level. A self-awareness of individual strengths and weaknesses leads to improvements in work behavior and performance, which in turn contribute to greater overall team performance (Antonioni, 1996). Even the process of completing the 360-degree feedback allows raters the opportunity to reflect on their own behavior and determine whether they may need to improve their own performance to better align with expectations (Dominick et. al., 1997). Effective 360-degree feedback should focus on behaviors that align to team values and objectives (London & Beatty, 1993). The process of completing 360-degree feedback provides raters with greater insight and understanding into the values and behaviors that are important for team success. Seeing how others are being evaluated allows team members to formulate their own expectations around goals for performance and behaviors (Dominick et. al., 1997). When 360-degree feedback is combined with setting specific performance goals that relate to developmental areas identified in the feedback, even greater changes in behavior are expected (Dominick et. al., 1997). Second, Locke and Latham even ventured so far as to say that introducing a formal feedback system into a group may motivate individuals to set their own performance goals without explicitly being instructed to so do. (Dominick, 1997). While there are several benefits to introducing 360-degree feedback into a team, there are challenges that should be considered before a team decides to implement a formal feedback process. them confused as to what behaviors are important and desired within the team. It is critical to frame up how 360-degree feedback will and will not be used within the team. Not clearly stating the outcome of feedback or failing to identify a follow-up plan for interpreting and sharing results can lead to fear and lack of trust (Carson, 2006). Raters may not be truthful or forthcoming with their feedback if they are unable to determine whether the feedback will be used in conjunction with a performance review versus solely for individual personal development (Carson, 2006). Walderman (1998) discusses research showing that up to 35% of raters change their ratings when they believe feedback will be used for performance and compensation decisions versus being purely developmental. This uncertainty can also lead to rater bias, such as halo bias or inflation bias. Even if these effects are mitigated, teams should remember that individual personality, attitude, corporate culture, and situational factors may all contribute to one’s desire and willingness to participate in the feedback process (Hurley, 1998). In addition to the above challenges, there are resource costs to launching a 360-degree feedback process for a team. The complexity of managing input from a variety of sources requires that time and money be invested from multiple parties (London & Beatty, 1993). Finally, crucial care must be taken to protect the anonymity of raters in the review process (London & Beatty, 1993). If a rater questions whether his or her responses will be explicitly shared with the individual, they may consider altering the response for fear of conflict or retaliation. While challenges exist to implementing a 360-degree feedback process within a team environment, the recommendations below help to enable teams to gain the benefits of 360-degree feedback and increase team performance through transparent communications and greater self-awareness. Prior to implementing a 360-degree process, it is important to consider the background and history of the team to determine whether this type of formal feedback is the right approach. A team should be established for a certain level of time – 1.7 years according to Hurley (1998) – before a formal 360-degree feedback process is undertaken. This allows for the team to get to know and understand each other before being asked to provide developmental feedback on team members. Additional factors such as maturity of the team, levels of trust, stability and commitment should be assessed prior to launch as these can also have positive or negative feedback implications (Hurley, 1998). Clearly communicating the intent and purpose may negate the effects of some of the biases that affect 360-degree feedback results. Decisions on structure should consider what purpose feedback will and will not be used for, along with devising an action plan for sharing feedback within the team (Antonioni, 1996). It is important to avoid the appearance of “dead-end feedback,” feedback that is collected but results in little to no follow up or attempted behavior change (Morgeson et. al., 2005). Providing an action plan helps prevent raters from becoming cynical and encourages them to provide feedback in the future. Leaders should also determine at the outset of the process the frequency with which feedback will be collected moving forward. Most recommendations call for feedback to be conducted in 6-12 month intervals from the start of the feedback process for teams to assess progress and performance improvements (Antonioni, 1996). Anonymity and a sense of fairness should be established early in the 360-degree feedback process. A minimum numbers of raters should be agreed upon prior to the launch of the feedback process to establish and protect rater anonymity. Antonioni (1996) recommends at least five raters complete the process for feedback to be shared with the individual. Additionally, raters and ratees must feel the process is fair and that they will be rated honestly (Morgeson et. al., 2005). Joint rater selection involving input from both the manager and ratee is the preferred approach to achieve fairness in rater selection (Carson, 2006). Feedback can be delivered by an external consultant trained in 360-degree feedback facilitation or an internal leader. If feedback is delivered by someone not experienced in feedback delivery, then post-feedback training is a critical element to ensure feedback is shared appropriately within the team and can be used in a way that helps propel the team to the next level of performance. Training should focus on helping leaders interpret feedback results, working with team members to identify strengths and weaknesses, handling and delivering negative feedback, and developing action plans for sharing feedback with the team and working towards established goals (Morgeson et. al., 2005). Since 360-degree feedback can be interpreted in a variety of ways, it is important to establish a framework for consistent delivery of results. This consistency will enable the team to achieve the benefits of 360-degree feedback that will increase their performance. In 2002, National Semiconductor’s India Design Center began using 360-degree feedback to increase team performance through more transparent team communications. At the time, the organizational strategy was shifting from product differentiation to low-cost producer. The shift was requiring teams to work more closely together and coordinate with team members and other teams within the organization. Multiple reporting relationships already existed, further emphasizing the need to effectively work together cross-functionally. The Design Center's team leaders had previously received feedback through individual 360-degree feedback assessments and clearly understood the value this process could bring to their teams. These leaders initiated the 360-degree feedback process by identifying competencies essential for team success and used these as the basis for questions in the process. They engaged an outside facilitator to deliver the results and facilitate the sharing of feedback within the team. Post-session, the team committed to one-on-one discussions of their feedback and regular touch points within the group to discuss their individual progress. One month after the team conducted the program, managers noted increased coordination and communication among team members. Utilizing 360-degree feedback can be effective in a team environment to promote self-awareness and create transparency in communications through trust, sharing, and increased clarity towards expected goals and behaviors. Implementing a formal 360-degree feedback process should not be taken lightly. Rather, to be successful leaders need to consider elements of the team, details of the process, and the long-term objectives and activities needed to sustain the benefits. Overall, a well-designed 360-degree feedback process can lead to an increase overall team performance. Waldman, D. A., Atwater, L. E., & Antonioni, D. (1998). Has 360 degree feedback gone amok?. Academy of Management Executive, 12(2), 86-94.